Long Version: Hello fellow SSIWers*. You may remember me from the forum, the eisteddfod, or a bwtcamp or two. I hope the whole learning thing is going well. Their channel started when some students went onto the streets of Germany and chatted to people, filmed it and subtitled it in both German and English for learners. It proved to be a big hit and there are now volunteers worldwide making Easy French, Easy Arabic, Easy Korean… and many more. I watched “Easy German” for months, it helped my German so much to get a look at how real Germans spoke and interacted in the real world, and be able to understand it with a transcript. It was also great to see a real slice of Germany, and German culture, before going out to live and work there. When I moved back to Wales and started learning Welsh, through SSIW and classes, the idea of a Welsh version naturally popped into my head, as I met lots of learners, many of whom don’t have access outside the classroom to “real” “normal” “spoken” welsh. I wanted to help address this issue, get more content in the medium of Welsh into the world generally, and also generally show off bits of Wales the rest of the world does not get to see. Anyway, after some fantastically fun street interviews with some awesome fellow learners, and a lot of swearing at the video editing software, it’s done! 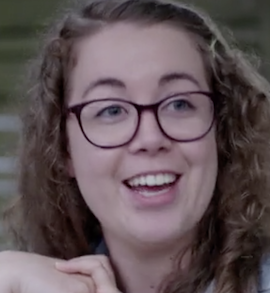 And I’m really excited to share it with you lot in particular, firstly because the makers of SSIW and the people I’ve met through it have given me so many good times, and helped give me the confidence to go out and interview strangers after just a year of learning Welsh (cheese alert, you are great ). And secondly because I think these videos chime with the SSIW ethos of "just get out there and experience some real Welsh, don’t be perfect, we’ll have some fun along the way ". You’ll notice the “don’t be perfect” rule is one I adhere to especially closely when you see my video editing. Enjoy the first video! There are more in the works already. And do share with other learners if you think it will be useful to them. Send me a PM if you can hold a camera and/or a conversation in Welsh and fancy helping with a future episode some time. Excellent work! It’s nice to see Welsh on the “Easy…” list as I’d previously watched a lot of their French and German videos like yourself. Nice idea and videos. good job, and thanks for posting! Let me just add an off topic note, cause I think it’s kinda funny. yesterday evening, I watched a few episodes of Parti Bwyd Beca. Now, when I saw your video was filmed in Dolgellau, I thought “Oh, what a coincidence! So was one of the episodes I saw yesterday”. Then in your video i noticed there’s a girl looking a lot like one guest in an episode yesterday. I remembered 'cause I was very proud that I had been (probably) been able to understand she said she had never eaten crab before but had enjoyed it; so I had re-watched it with subs to make sure. Now I checked it again to see if i remembered right. Isn’t this the same person you met? Oddly enough, in Beca’s show, she was not in the Dolgellau, but in Aberteifi. In your interview she’s saying they had never stopped there before, they just decided to try and find a place to have lunch - so it would make sense. Nothing really important, but just seemed a strange set of coincidences. Or, we just discovered there are mysterious clones traveling and eating around Wales! I watched the first video. It was great and reassuring to see that the Welsh spoken by some people wasn’t perfect, but I find the English subtitles really off-putting! It’s too difficult not to notice them when I’m trying to read just the Welsh. Could future videos make the subtitles optional? I’m looking forward to seeing the next episodes now. It’s nice to see something a bit more modern than “Now You’re Talking” on YouTube for Welsh learners. Great idea Sylvi. Heading for 3000 YouTube hits in a day too. I think one of the things that most learners worry too much about is the need to be “classroom perfect” or “Queen’s Welsh” if such a thing exists, and the reality is, people out on the streets just don’t speak like that in real life. They’re flexible with their language, if they mal-mutate, they don’t worry about it, they probably don’t even know they’re doing it - they use the word “round” instead of “o gwmpas” now and then, they use “ordero” instead of “archebbu” sometimes. I suppose the question is… one native speaker may not correct another native speaker if he says “o Bangor” (as the guy in the video does) but might they correct a learner if they missed the same mutation? Thanks Macky The initial hits are due to the popularity of the existing channel really. Still I’m so heartened that people across the world who might have never heard any Welsh before have been curious enough to take a peek, and have seen it being used as a living language. I find the English subtitles really off-putting! It’s too difficult not to notice them when I’m trying to read just the Welsh. Could future videos make the subtitles optional? That’s a good point, unfortunately that’s the format of the channel, and how the subtitles templates they supply work, to have both the target language and English, to help those who aren’t as advanced as you (and if you can understand it all/most without the English you are pretty advanced already so hats off ). Maybe someone here can suggest a more techy solution to what I would do, which would be to unmaximise your browser and move it down your screen until the English lines are obscured?? I’m looking forward to seeing the next episodes now. Oh no, it’s not because I’m advanced (far from it!)! It’s because I feel I’m cheating if I’m reading the English; I’d rather struggle / look up the Welsh if I can’t understand what’s been said. To be honest, I’ve never ever been corrected by a first language native speaker ever, it simply doesn’t bother them - and the only time I’ve ever seen a first language native speaker correct someone was in a business situation where the error would have led to some embarrassment for the non-native speaker. Reassuring to know, Nicky. Thanks! @Iestyn has one of the best ways of correcting people, which he does in a way that gets the error over but gives the other person very little anxiety. What Iestyn does is if he’s chatting to a person who says something like “Can you see the ddau cath?”, he’ll reply back with just “Yep, I can see the dwy gath”. Re-enforcing the correct Welsh, but without going down the “You were wrong. This is right” route. Great to see you throwing yourself into it like that, Sylv! I think one of the things that most learners worry too much about is the need to be “classroom perfect” or “Queen’s Welsh” if such a thing exists, and the reality is, people out on the streets just don’t speak like that in real life. Yes! 100% this! Over half of the fluent native speakers we interviewed on the days we filmed said something like “Ooooh I’m not sure if I can speak on film, I can’t speak proper Welsh”. Arghhh! Yes, my experience too. People are just nice and encouraging (@eckhard 's recent story over on the “breakthroughs” thread is a lovely example of this! ).